Today we have had a bit too much of back to the future. Sailing ships and the horse and buggy need to be offset by some real Jetson’s style geewhizzery. 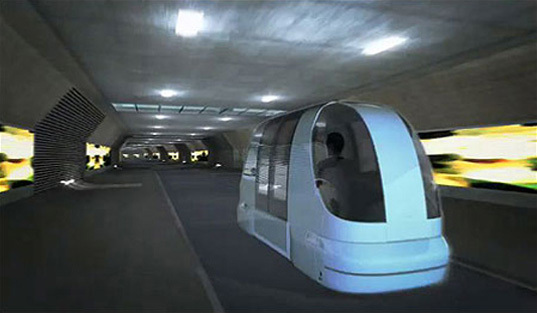 This image comes from a short item from Inhabitat which may I think refer to Abu Dhabi. No rails, and also the solar power must be collected and transmitted somehow – not collected on board. It’s part of a city plan for Masdar which will be waste free and zero emission. And of course they are not much troubled by dull wet days there. It’s disingenuous to imply that this is an environment that people would spend much time in. The PRT is grade-separated — in this case underground — in order to create a 100% pedestrian & bicycle-friendly environment above, without the need for the baking-hot open spaces that automobiles, or even trams would require. This allows the designers to a more traditionally Arabian courtyard-and-alley based urban design — which uses natural cooling principles to create a pleasantly cool microclimate — without completely forgoing the convenience and economic benefits of mechanized transport. As for the solar power that “must be collected and transmitted somehow on not collected on board”: that is accomplished via some astonishing series of technologies known as “wires,” “charging stations,” and “batteries.” Hard to believe, I know, but it’s true. Ooh – did someone wake up grumpy today? If the tag line had been “electric powered PRT” it would have been more accurate. The source of the electricity is then the grid. It is almost as silly as Calgary claiming its LRT is wind powered. And yes one of the things I expect people to do is follow the links. The point of a blog is to provide interesting links and comments not just replicate. Sorry for the sarcasm, but when you write something like “I think an old fashioned street with trams, bikes and pedestrains would look a lot more welcoming but then I am obviously a Luddite” — that’s a sarcastic statement, which falsely implies that Al Masdar does *not* create such an environment, and invites sarcasm in reply. You’re right, the PRT is grid-powered. But the Al Masdar grid is almost entirely solar powered (a bit comes from wind), so this a really hair-splitting distinction. If the Calgary grid were almost entirely wind powered, then I think it would be fair to make that claim about its LRT. But I don’t think that this is the case, so the parallel doesn’t hold.